strawberry-brie sandwiches on the waterfront! OMG! We’re having a great time! Last night we were hosted once again by the Martins, manjula’s dad and stepmom, in Santa Cruz. They treated us to a feast of homemade chili rellenos and tomales! 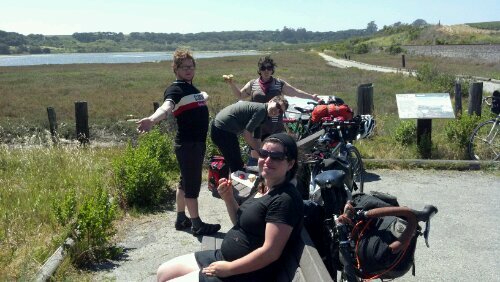 Now we’re scooting towards Monterrey via watsonville and the elkhorn slough. Sasha and I are starting a new religion based on pie worship. If you accept pie into your life, you will find heaven on earth! that’s a religion i can support. keep rockin’ it, BFL & co.! Oh my gosh! The Bums are at it again. You guys are becoming the stuff of legends! Previous Previous post: Pie town!